View an extract of this session held at the Generation AI: The New Data-Driven Investor event in September 2018.You can also access the full video. Rajesh clarifies the difference in the role played by new data vis-a-vis the role played by new analysis techniques. He also classifies data science techniques based on their academic provenance. He argues for certain areas/regimes possessing the most and the least potential for application of big data analysis techniques. What can Machine Learning do for a Quant? 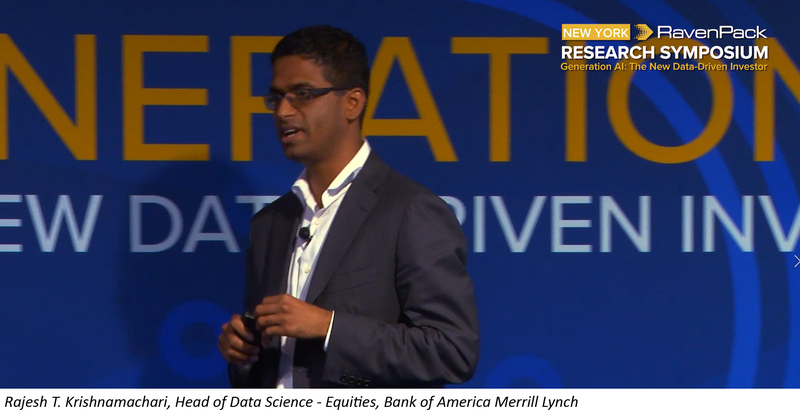 Request access to the full video of the session "Big Data and Machine Learning in Investing" held at the RavenPack Research Symposium in New York City in September 2018. Slides are not available for compliance reason. Recently, RavenPack hosted its 7th Annual Research Symposium in New York titled “Generation AI: The New Data-driven Investor”. Close to 1,000 finance professionals registered to attend the event, an increase of nearly 50% from last year’s event. Surely, artificial intelligence and big data continues to grab the attention of the investment industry. RavenPack’s Research Symposium is the “must attend event” for quantitative investors and financial professionals that are serious about Big Data. Today, most financial institutions are working hard to adopt a data-driven approach. Although many asset management firms, banks and hedge funds are beginning to disrupt their analytics landscapes by gathering immense volumes of data assets, these companies are at varying levels of Big Data maturity.